These are the famous Tsavo Man-Eaters. In 1898, they killed over 135 people, and stopped work on a railroad before they were finally shot. Like many male lions in the Tsavo region, they have no manes. A 10-year study shows us part of the reason why. 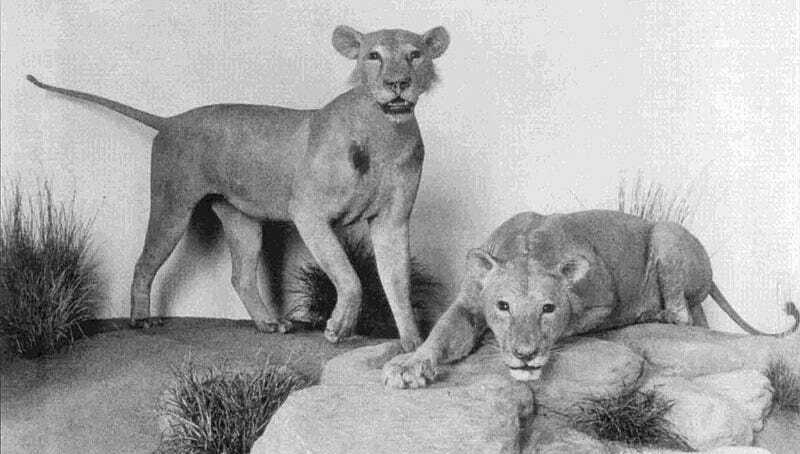 The Tsavo lions have been sitting in the Field Museum since Lt. Col. John Henry Patterson, the man who shot them, sold their skins and skulls to the museum in 1925. I guess it’s not possible to spend a career staring at a weird-looking lion and not try to find out about it, because in 2006 Bruce Patterson, the curator of mammals at the Field Museum, announced that he knew at least part of why these male lions don’t have their manes. The area that is now Tsavo East National Park in Kenya is blisteringly hot. A full mane is also hot. Put a lion, any lion, in a colder climate and its mane will start growing. Turning the heat off will let you control a lion’s hair length. Image: Internet Archive Books. Second Image: Matt Berlin.